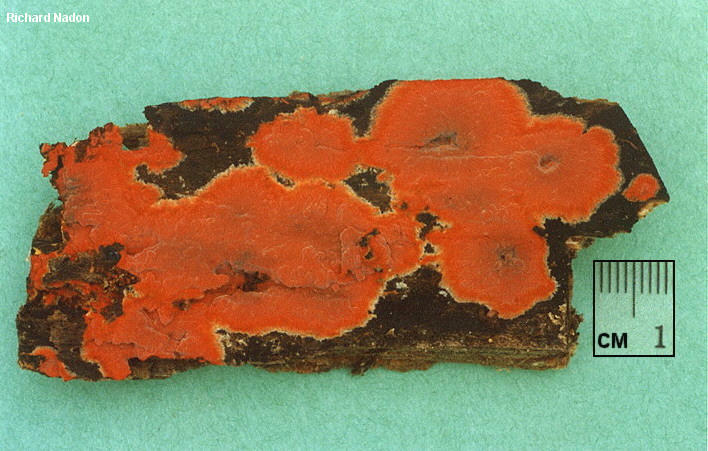 This striking crust fungus features brilliant red colors when fresh, but over time darkens to a much less thrilling reddish brown. It can be found spreading across the dead logs of hardwoods throughout North America--but it is more commonly encountered in the upper Midwest and in the northeast. 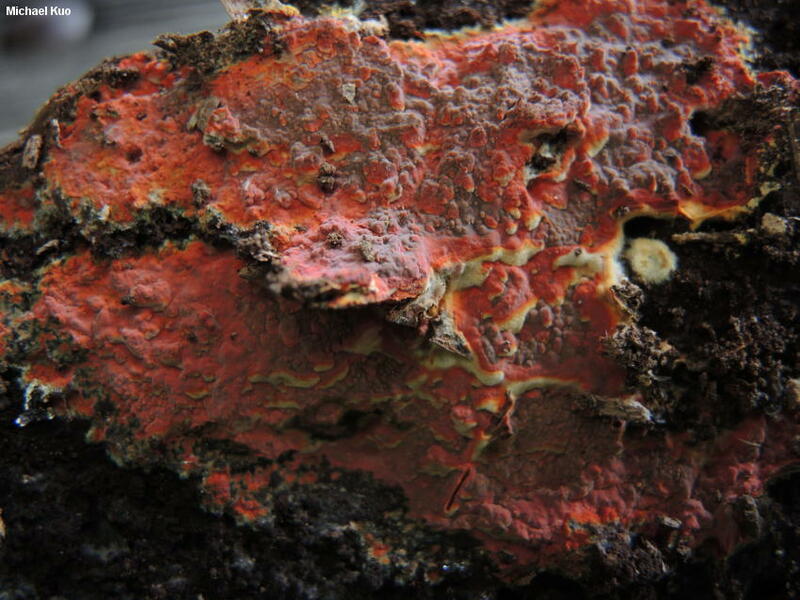 The surface of Phlebia coccineofulva is hardened, unlike the softer surfaces of other well-known species of Phlebia. Under the microscope, it features tiny ellipsoid spores and amazing cystidia that become encrusted with crystalloid material. 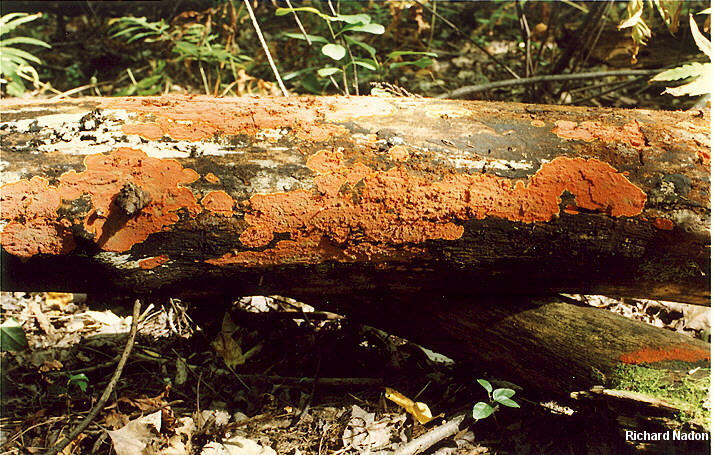 Ecology: Saprobic; spreading in patches across the decorticated deadwood of oaks and other hardwoods; causing a white rot; annual; summer and fall (and over winter in warm climates); widely distributed in North America but much more common in the upper Midwest and the northeast. The illustrated and described collections are from Pennsylvania and Québec. Fruiting Body: A spreading patch up to 20 or more cm across; surface hardened, wrinkled and bumpy, dry, at first very bright scarlet to scarlet orange, darkening with time to brownish red and eventually reddish brown; secondary surface (visible at the edges of fresh, growing specimens) yellow, finely hairy. Microscopic Features: Spores 3.5-5 x 2-3 µ; ellipsoid to sublacrymoid; smooth; hyaline to golden in KOH; inamyloid. Basidia 4-sterigmate. 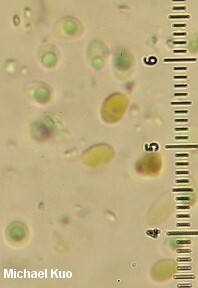 Cystidia abundant; 35-65 x 5-12.5 µ; fusiform; thick-walled; the upper half thickly encrusted with golden, refractive material. 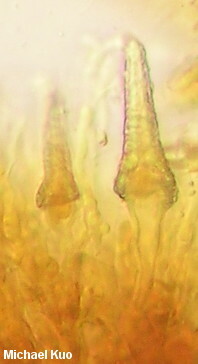 Hyphal system monomitic; hyphae 2-3 µ wide, thin-walled, hyaline to golden; poorly reviving in KOH. Clamp connections present. REFERENCES: Schweinitz, 1832. (Burt, 1925; Cooke, 1956 ["atkinsoniana"]; Maekawa, 1993.) Herb. Kuo 09191502.